This variety of green bean is also called a snap or string bean and is a native of South America. It found its way to mainland Europe in the sixteenth century and soon after crossed the English Channel to England. Some say it was brought in by the French Huguenot refugees during the reign of Elizabeth I. 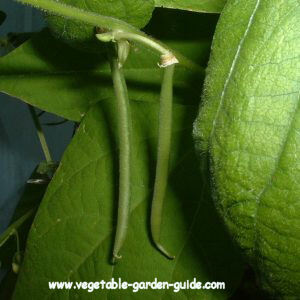 The green beans are eaten along with their pods before the seed begins to bulge. Once the seed has matured and the pod has dried out these beans are called Haricots... so all-in-all a very versatile vegetable for planting. A light but rich soil is best when growing French Beans. Cold, wet heavy soil, or soil that is acid is deadly to them. Planting your French Beans in a sunny, sheltered part of your garden is best. Prepare the bed in the autumn and dig in well rotted compost or manure. Like all peas and beans lime should be added at this point if the soil is too acid. Aim for a pH of 6.5 to 7.0 if you test your soil, otherwise... just have fun experimenting. You will learn far more about your garden that way. Growing French Beans in the same spot as last year is to be avoided. In the spring fork over the bed in preparation for growing your French Beans, breaking it down to a finer tilth - raking in a general fertiliser two weeks before you start planting this variety of green bean. These varieties of Green Beans like getting into a warm bed!... and who doesn't - don't you just feel their need. In cold soils these green bean seeds are prone to rot. 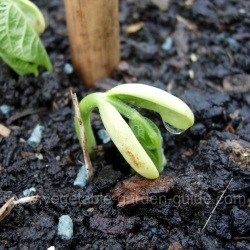 To sow your French Bean seed make a groove or drill... as it is called, in your prepared green bean bed, 5cm(2") deep. The modern recommendation is to plant the seeds much closer than the old text books would indicate so plant the seeds 10cm(4") apart in the drills. Ensure rows are 45cm(18") apart. Sow a few extra seeds at the end of your rows to transplant into any gaps where beans have failed to germinate. Expect the seed to germinate in 7-14 days. If you want to pick some of these vegetables before the end of June then growing French Bean plants under protection will be necessary. Choose a variety that is quick to mature. Place cloches or fleece over part of the bed at the begining of March. Sow seed under them in early/mid April. Protection can be removed towards the end of May. Your maincrop should be sown during May when all danger of frost has gone. Make a second sowing three weeks later. Growing French Beans at the end of June will give a crop in September/October but be prepared to add protection. Not much room to grow anything? 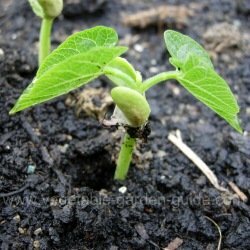 Thats no excuse ;0)... try growing French green beans in a container filled with compost. Grow a climbing variety supported by a 'wigwam' of poles or canes. this will provide a very worthwhile crop. French beans like lots of water so make sure you don't let the compost dry out and liquid feed every two weeks when the pods are forming - see photo above. These are French Beans I planted in a container from which I had an excellent crop. But let me repeat... they grow a mass of fine roots and fill the container with them and so are very, very thirsty - water regularly in containers. Protect new shoots from slugs as they begin to germinate and protect the ripening pods from other greedy monsters like the one in the photo. He is often seen picking off French Bean pods and devouring them with gusto. Hoe to keep down the weeds when seedlings are small - mulching with wet newspaper under straw or strips of black polythene will supress weeds and keep soil moist - do this as the plants get taller. Compost the paper and straw when the growing season ends. Support your French bean plants with short twigy branches or pea sticks to prevent them falling over or being beaten down by heavy rain. Use poles or plastic netting for climbing varieties. Black Bean Aphids adore French Beans, indeed all green bean plants - keep a dilligent watch for their appearance. A serious infestation will badly stunt plant growth. Check over the leaves and stems of your vegetables, especially the tender growing tips... gently squish any colonies you find - gently for the plants sake and not the aphids. A chemical spray may be required if the infestation becomes too serious. Pop into your local garden centre or nursery and ask their advice what to use. Slugs can also be a problem and can be dealt with using a combination of different methods. Enter your vegetable garden at night with a torch and collect the slugs by hand - they can be disposed of by placing in a box containing salt. Place barriers around the French Bean plants... something rough that makes it difficult for them to slither on - like egg shells or sand. Or cover your seedlings with plastic bottles with both ends cut off and pressed into the soil over them. Nematodes are a very effective way to kill slugs without harming people or wildlife and is becoming a popular method of control. Nematodes are naturally occuring organisms which can't be seen by the human eye. Sold in packets - purchase them at garden centre or nursery, place the the contents as directed into a watering can, add water then apply to your vegetable garden. These little darlings then enter the slugs and kill them. They go on being effective in the soil for about six weeks. Slug pellets are effective but need to be used sparingly as they can be a danger to wildlife because the chemicals metaldehyde or methiocarb they contain. I live next to a small stream so I am blessed with lots of frogs in my vegetable beds - they love slugs. Encourage beneficial wildlife around your veg patch - for example, purchase a purpose built hedgehog home. This all increases the enjoyment of your vegetable growing experience. 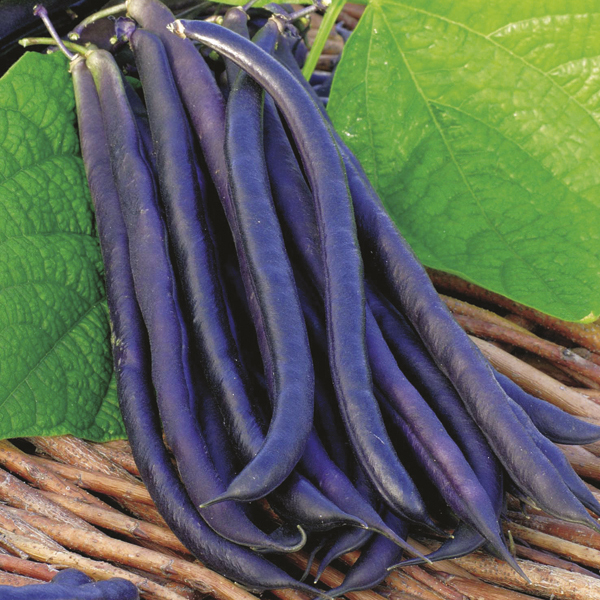 Begin harvesting your French Beans from July onwards (maincrop). Pick when they are about 10cm(4") long - when picked the pods should 'snap' easily when bent. This is why they are sometimes called snap beans... I'm just too clever for my own good :0). This is my wife, Ros in the photo to the right. She is casting her experienced eye over the the growing pods to see if any can be picked before that greedy monster above (see photo under 'Caring for Plants') scoffs too many. 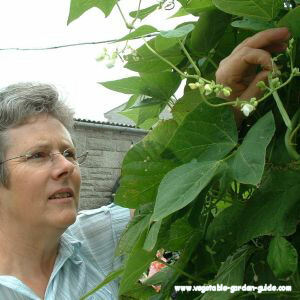 Pick often so none of the green bean pods mature... this will ensure 5 to 7 weeks of harvesting this delicious vegetable. 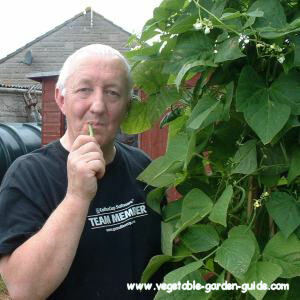 Take care when removing the beans from the stalk... don't loosen the plant at the roots, instead use scissors or secateurs to cut the beans off the stem. If you want some dried beans (Haricot) then try leaving some pods on one or two of the plants and let them turn the colour of straw. Hang the plants somewhere dry... preferably indoors. When the pod dries out and splits, remove the beans and lay them out to dry and when ready store them in something air-tight. French Beans are ideal for freezing if you have a glut.